Developing a traditional CMDB? You're just wasting your time! Efforts to build traditional CMDBs regularly fail in part because the design and approach has been fundamentally flawed from the beginning. We need to look to other areas of data correlation and manipulation such as Business Analytics (BA) and Business Intelligence (BI) if we want to solve this organizational challenge. Configuration Management is an organizational need and should not be viewed simply an IT desire. As IT leaders, we must demand that the proper toolsets from our vendors be made available or look elsewhere to BA & BI vendors for help with todays’ Configuration Management solution. Carlos Casanova, President & Solutions Architect, K2 Solutions Group, Inc. 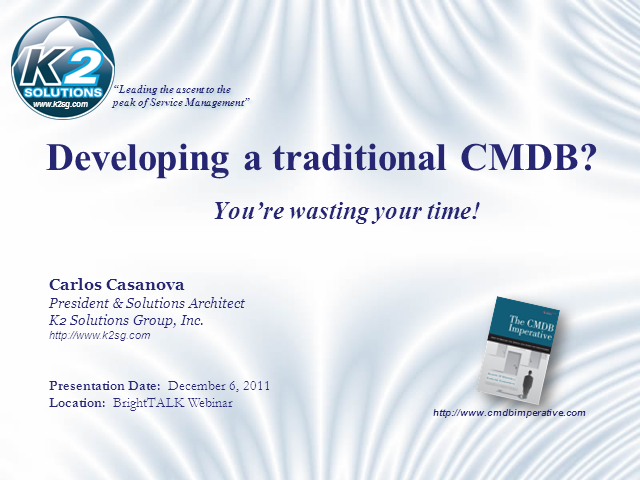 Title: Developing a traditional CMDB? You're just wasting your time! Presented by: Carlos Casanova, President & Solutions Architect, K2 Solutions Group, Inc.